This is one area on an old Benz that really gets neglected. In fact you may even be asking yourself, "What could possibly need servicing inside the doors?" 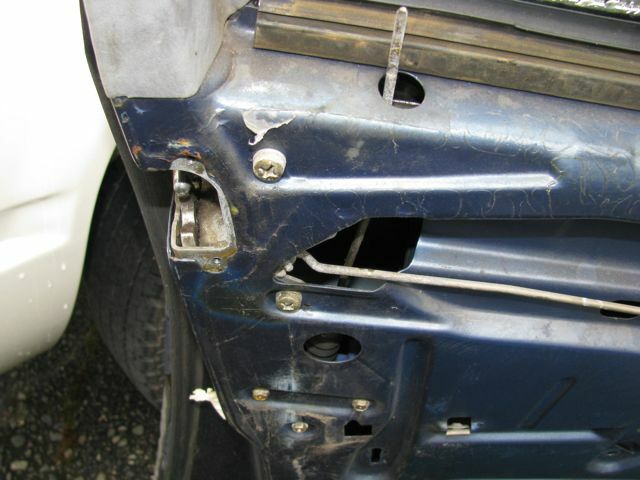 Believe it or not, there are actually quite a few things that need attention, and if they don't get it, your doors may suffer from broken or bent power window regulators, failed door check straps, sticking door locks, doors not shutting properly, or even bottoms of doors rusting out. No 1. Cause of problems is moisture. There is a lot of water that has run down through the door over the years. If the bottom drain holes are not clean the water can be trapped and lead to rust out. The moisture deteriorates or removes the factory grease on the door latch mechanism, window regulator gears and slides, and the door check strap. 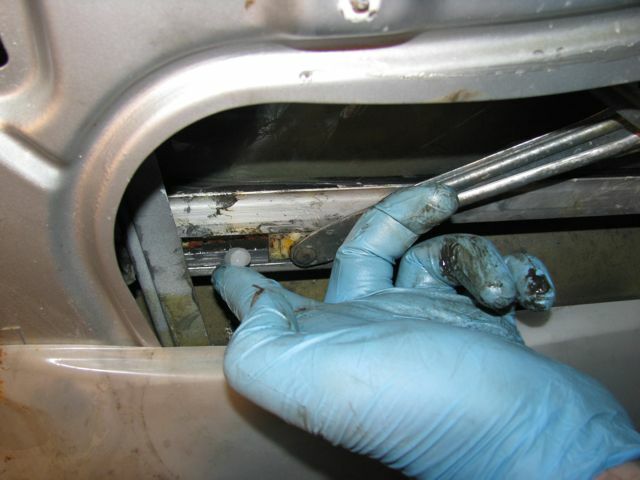 To prevent premature failure, the check strap, window regulator gears, and window slide tracks need to be coated with a heavy moly grease or a synthetic water proof grease. Use a spray lubricant to spray the door latch and lock assembly from inside the door. Clean the drain holes at the bottom of the door and if you find any rust coat it with Miracle Paint BEFORE it grows. 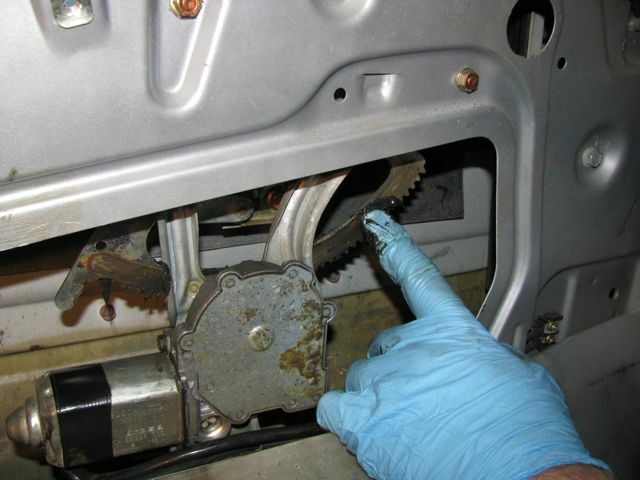 Once you remove the door panel, begin by checking the tightness of all the nuts and bolts that hold the window regulator as well as the door check strap in place. You will find anywhere from 5 to 7 fasteners for the window regulator and 3 for the check strap. 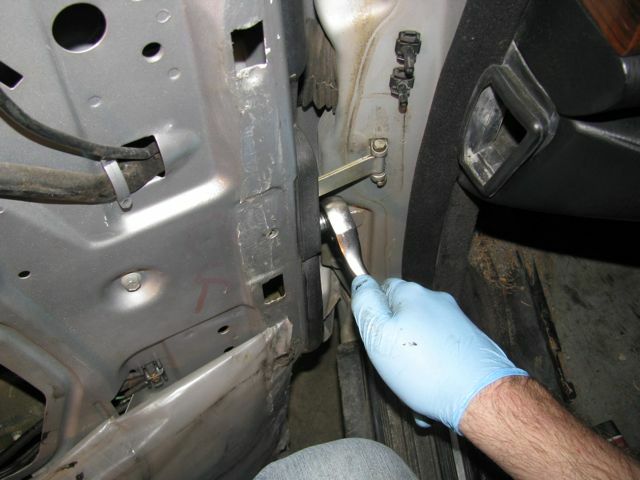 This second picture shows accessing the two front bolts that hold the check strap to the front edge of the door. It is common for these to loosen up. Using either a thick moly grease or a water proof synthetic grease, thoroughly coat the gear and slide mechanisms of the window regulator. You will be amazed how much smoother and faster your windows go up and down. The grease deteriorates over time due to rain water running down through the doors. Then get a good glob of grease and reach up inside to try to fill the inside grooves of the door check strap. If you have to, bend and modify an acid brush to put the grease where you need it. 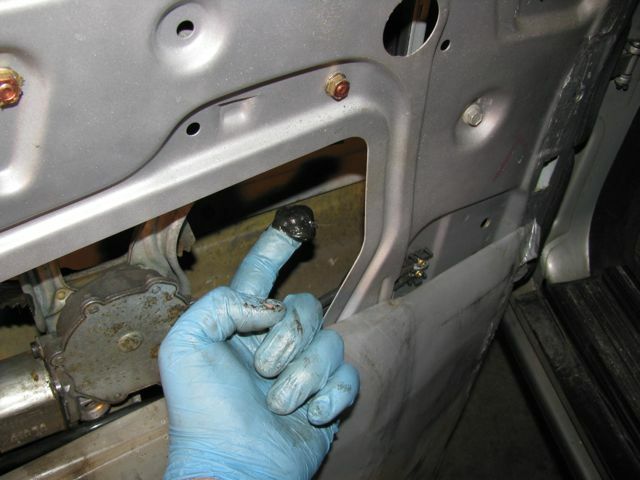 Next, use spray grease to thoroughly lubricate the inside of the door latch - door catch assembly. Your locks will work a lot smoother and you may even find your key lasts longer. Inspect your door lock actuators, test with a vacuum hand pump tester and lube the linkages. Finally, check the drain holes in the bottom of the door and clean if necessary. If you see any signs of rust coat the area with miracle paint or you will be sorry (see previous tip). And when you are in there be sure to check for rust - especially along the bottom edge where the water drain holes are located. If you find some, Miracle paint is the absolute best way to fix this type of rust. For 190E and 190D only fits FRONT DOORS - ALL 126 and 124 fits BOTH front and rear doors.